It's amazing how fast weekend days fly by. I planned to start crafting first thing this morning, but time slipped by (probably due to my spontaneous decision to cut my own hair, which is a story for another day) and I didn't get started on these Christmas tree ornaments until 1pm. Before I knew it, it was time for dinner. 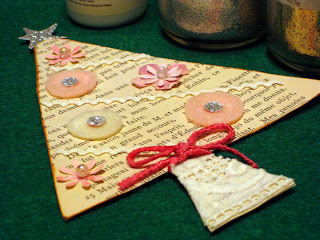 The ornaments are from the book Pretty Little Felts and made with pages from antique books, felt, glitter, and vintage lace. For this first one I followed the instructions in the book fairly closely to get the hang of it and learn some new techniques. I spent a good part of Saturday knitting a sock, with about three inches of toe to show for it, so today I really wanted to make something I could actually finish in an afternoon. On the second one I did my own thing with gold wire, buttons, and gems. 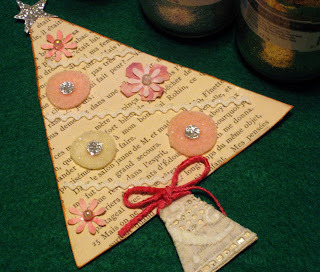 I plan to use mine to decorate gifts instead of as ornaments, but they'd be great as garlands, too. Normally I'm glitter-challenged, but I recently started using Martha Stewart's glitter with good results (i.e. the cats, television, and carpet aren't covered with it). Now it's cuddle time. Charlie and I are on the couch with a wool blanket watching one of my favorite Christmas movies, Elf. Have a good week. For those of us in the states, it's a short one. Hurray! Oh I just love those! I love these trees!!! SO cute! It's gloomy and rainy here today. A good day to hunker down. Sweet ornaments! Sounds like a perfect weekend all snuggled up with Charlie! Hope all is well with you, looking forward to Thanksgiving here too! HUGS! Lovin' the trees and what a sweet picture of Charlie. Hooray for a short week! tomorrow is the last one for me until Monday. WOOHOO! Beautiful! I love your trees. What a great way to spend a weekend! Love your second tree with the wire! It's lovely! 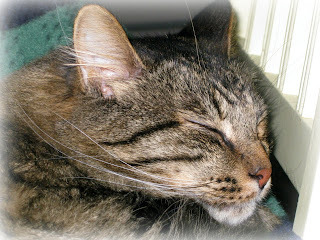 And, so glad you found time to cuddle with Charlie, he looks like one happy kitty! 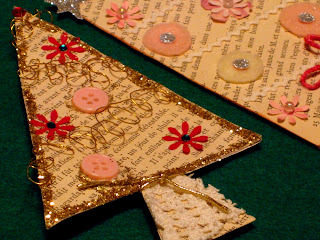 Stacy~those are darling crafty Christmas trees. Glad to see that you are back doing your creative crafting. Have a fun weekend.